I heard about Senuti long ago, and even copied the .dmg to my iPod, but I never used it until recently. 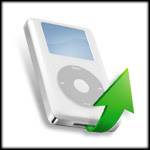 I don’t have much use for moving the songs from iPod to iTunes, but what Senuti actually does, that is very useful to me, is act as a remote control, allowing you to connect an iPod to a Mac, and use Senuti to contol what is played, without having to copy it to the host Mac. This is perfect! I can take my iPod to the office, and plug it into the iMac and listen to my music and podcasts without having to deal with one more iTunes library. Once I figured this remote control thing out, I emailed the author a big thanks for the work he’s done, and made a small donation. Hooray for Senuti! Posted on Thursday, September 7th, 2006 at 12:00 pm. Subscribe to the comments feed. Both comments and pings are currently closed. Post on your own blog.